Mercenaries are not at all a new phenomena in Latin America. Already in the 16th century Latin America was invaded with mercenaries. The Spanish and Portuguese Conquistadors were a special breed of men: brutal, ruthless adventurers who would stop at nothing to carve out wealth and fame for themselves and an empire for Spain. In most cases, the conquistadors were not soldiers from the national armies of these invading countries, but mercenaries who set out on these conquests to build their fortunes with the spoils of war. They had to buy their armor, sword, and horses. However, in some cases the national military of a country would descend upon a native country and wage war with them and then claim the land as theirs. The most famous example of this is Hernan Cortes and his army, which was funded by the nation of Spain in their quest to bring the Aztecs down. Men like Hernán Cortés and Francisco Pizarro left their bloody mark on the New World. A US PMC is a company that is contracted to deliver military services to the Ministry of Defense (Pentagon) or in some cases the Ministry of State. In essence we're talking about mercenaries, while there can be discussion about the exact definition. The contractors are mostly former well-trained US militaries. They could be advisers, trainers, pilots, service personnel, security guards, reconnaissance or intelligence workers and so on. In the Iraq war there were 100,000 contractors active on the ground (i.e. Academi f.k.a. Blackwater, CACI, Titan Corp and others). US PMCs have become an important part of modern warfare and "soft" US interventions, where PMC activities usually are disguised as "aid". Mercenaries are prohibited in the modern age by the United Nations Mercenary Convention, a treaty that prohibits the recruitment, training, use, and financing of mercenaries. The US didn't sign or ratify this convention. Also the US refused to ratify, acknowledge or adhere to the International Criminal Court (ICC), which is a permanent international tribunal to prosecute individuals for genocide, crimes against humanity and war crimes, located in The Hague, Netherlands...On the contrary...the US enacted the The Hague Invasion Act in 2002 that aims to protect military personnel against criminal prosecution by an international criminal court to which the United States is not party. It authorizes the US President to use "all means necessary and appropriate to bring about the release of any US or allied personnel being detained or imprisoned by, on behalf of, or at the request of the International Criminal Court"! The use of PMCs in foreign missions gives the Pentagon some advantages: Military contractors are less visible to the public and even American Congress. The Pentagon doesn't like US troops being killed or captured by rebel-groups in foreign countries. That's bad publicity and could have severe budgetary and mission implications. Check out the Blackhawk Down incident for instance here and here. Contractors are often provided with immunity from the local law. Sometimes PMC employees can be subject to domestic criminal law and civil liability in the contracting country, the country of operation and in the employee’s country of citizenship. However, the absence of rules specifically governing PMCs is an obstacle to enforcement. Until 2007, when the US Military Extraterritorial Jurisdiction Act (MEJA) was enacted, contractors were also provided with immunity for US laws. Unfortunately since then, very few successful prosecutions under MEJA have been reported. If captured, mercenaries are not entitled a Prisoner of War (POW) status, according to article 47 of the Additional Protocol I of the Geneva Convention. This is an extra danger for contractors, because the enemy will shoot contractors therefore faster. No mercy with mercenaries... This could also lead to weird situations facing insurgents in a conflict-zone. For instance in Colombia three US contractors (Gonsalves, Stansell and Howes) on a reconnaissance mission were made prisoner by the FARC after their aeroplane had an engine failure. Because they were on a reconnaissance mission using Infrared and Laser equipment (also) searching for FARC camps, the FARC considered them as the enemy and treated them as POWs. A POW-exchange was tried to arrange with the Colombian authorities but was unsuccessfully. After 5 years in captivity they were liberated by the Col. army. Later, FARC-commander Beltran Herrera was captured and on request extradited to the US for taking hostage "US citizens". There exists no other option in US law than to prosecute for "taking hostage" in such a case. The same procedure was applied for FARC commander Simón Trinidad. The next time the FARC or any other rebel-group encounters US contractors they will most certainly be shot on the spot, with no witnesses. Psychological damage, post-traumatic stress, survivor's guilt, nightmares, depression are commonly seen. Strangely, what seems to balance the psyche of a military contractor is more trauma and more adrenaline. Working in a dangerous place has more of a calming effect then anything else. That's why army veterans often become mercenaries. Many years of operation in combat zones, virtual immunity, no rights to a POW status if wounded or captured, minimum of psychological after-care, can make a PMC employee fire their guns more easily in situations where a US army soldier wouldn't. The United States maintains a complex fast growing web of military facilities and functions in Latin America and the Caribbean, what the U.S. Southern Command (known as SouthCom) calls its “theater architecture.” There are only a few official US military bases, called "Main Operational Base" (MOB) in Latin America: São Paulo Naval Support Detachment in Brazil and and Soto Cano Air Base in Honduras. Since 2001 the Pentagon has been reorganizing their military presence outside the US in more smaller and agile facilities. According to Southcom there are two more "Cooperative Security Locations" (CSLs) in in Latin America, located in Aruba-Curacao and Comalapa, El Salvador. You'll find several "Forward Operating Locations" (FOL) in Latin America too, besides Forward Operating Site (FOS), Forward Support Location (FSL), Preposition Site (PS) and En Route Infrastructure (ERI) facilities. Check out for instance the new FOLs in Honduras. All these US military facilities require some services of US PMCs. Since the early 1990s contractors are performing more frontline roles than before including participating in combat. These PMCs are hired to complete a task within a set budget. However, a less well defined area has been the rules of engagement. 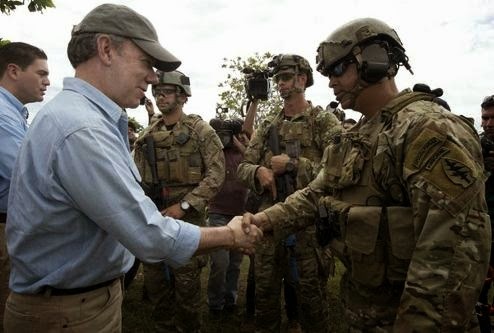 How many US Private Military Companies are active in Latin America and in which countries? You might be surprised how many US Private Military Contractors are present in Latin America on all kind of missions. Below you'll find an overview of the Latin American countries in which most US PMCs are active. According to a 2009 report released by the US State Department, there are 17 primary contracting companies working in Colombia under the umbrella of "Plan Colombia". The largest contracts have gone to companies like Lockheed Martin, DynCorp, and Northrop Grumman, but lesser-known firms like the Rendon Group (providing public relations support for the Ministry of Defense) and Science Applications International Corp. (assisting in imagery analysis) are also here. Big companies such as DynCorp International, in charge of piloting planes that spray coca crops, and Northrop Grumman's California Microwave Systems (CMS), which operates counter-narcotics missions, did not release the number of employees involved in their operations. But the report counts at least 190 contractors employed by "Plan Colombia", a US-backed anti-narcotics and anti-terrorism program. In theory, US law mandates that no more than 600 civilian contractors can be on the ground in Colombia at any one time and 800 U.S. military personnel. Experts say that the US often hires nationals from places like Brazil and Central America who don't count toward the cap. Besides other aircraft Dyncorp pilots did fly Blackhawk UH60, Blackhawk S70 and UH-1 Huey-II helicopters in Colombia in the past and occasionally still do. They've frequently participated in combat actions with FARC and ELN. 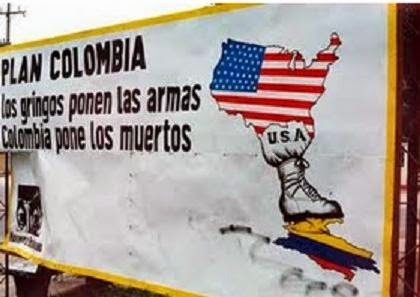 The U.S. is permitted access to three Colombian air force bases, located at Palanquero, Apiay, and Malambo, to two naval bases at Bahía Málaga and Cartagena, and two army installations at Larandia and Tolemaida. Also access is permitted to other Colombian military facilities as needed and mutually agreed upon. These seven locations are intentionally not referred to as US military bases by the Pentagon. The Mérida Initiative (aka Plan Mexico) is a 2008 security cooperation agreement between the United States and the government of Mexico and the countries of Central America to combat the threats of drug trafficking, transnational organized crime and money laundering. It has lots of similarities with Plan Colombia. The US aid includes training, equipment and intelligence. The US monies that were spent from 2008-2013 totals to USD 2.4 billion. Equipment that was deployed includes 13 Bell 412 EP helicopters, 11 UH-60 Black Hawk helicopters and 4 CASA CN-235 transport aircraft. Training would, in large part, be provided by US PMCs. According to the Washington Post DynCorp International - who is in charge of the border posts between the US and Mexico already for many years - is providing aviation instructors and mechanics and the consulting firm Kroll hires anti-kidnapping specialists to protect Mexican business executives. MPRI is training Mexican soldiers in counterinsurgency techniques. Article 27 of Mexico’s firearms code bans foreigners from carrying guns in Mexico. Therefore many US PMCs that are operating in the security branch do not even consider to work in Mexico. In 2008 a video emerged of city police officers from León, Guanajuato, Mexico, being taught torture methods by a U.S. security firm instructor. In 2012 concerns rose when US Southcom started training the notorious Guatemalan Kaibiles in in hand-to-hand combat and “nonlethal” crowd control techniques to quell riots and protests and funded training facilities of the Kaibil Training Center in Poptún, Guatemala. The Caribbean Basin Security Initiative (CBSI) brings all members of the Caribbean Community (CARICOM) and the Dominican Republic together to jointly collaborate on regional security with the United States as the leading partner. 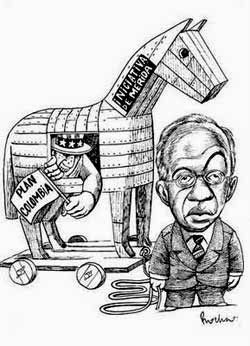 In fiscal years 2010 through 2012, the Department of State (State) and the U.S. Agency for International Development (USAID) collectively allocated about $203 million in assistance for CBSI activities in the Bahamas, the Eastern Caribbean, Guyana, Jamaica, Suriname, Trinidad and Tobago, and the Dominican Republic. The initiative involves training, equipment, implementing prisons/corrections reforms, improving asset sustainment and maintenance practices.